From Inner to Outer: Digression: Books I'm Reviewing—David Mitchell's "The Bone Clocks"
Digression: Books I'm Reviewing—David Mitchell's "The Bone Clocks"
Lugging around an advance copy of The Bone Clocks, David Mitchell’s doorstopper of novel (that’s now on the Booker Prize longlist), and devouring its six weighty sections over July—in cafes, on busses, at parks—drew interest from normally shy or indifferent locals. For the sake of reader edification, then, this review is built upon their questions. 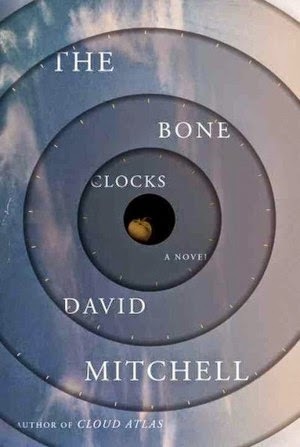 A bone clock is a derogatory term that’s spoken at just a couple of points in the novel. Sort of like “muggle” in the Harry Potter series, it’s used to dismiss ordinary humans, or to put them in their place. In a sense, yes. In Mitchell’s tale, two rival groups of shadowy immortals have assorted psychic abilities that would strike you or me as supernatural. Their Acts of Psychosoterica (which include Hiatus, a kind of freezing, and Suasion, which persuades individuals to obey a mental direction) are complemented by psychic communication. Well, plenty. Over its 620 pages and in no particular order, I thought of David Cronenberg’s Scanners, Timor Bekmambetov’s Wanted, Doug Liman’s Jumper, and Highlander (the television series). Also, John Wyndham’s The Chrysalids. I’d probably have thought of certain Dan Brown thrillers if I’d read them, so I’m referring to the filmed versions and their labyrinthine conspiracies. Ditto for Harry Potter. Isaac Asimov’s Foundation novels. Oryx and Crake. Cloud Atlas (the novel, not the film). Let England Shake, P.J. Harvey’s album. Interview with the Vampire, by Anne Rice. On one level, it’s an account of the hard life and times of Holly Sykes, from 1984 to 2043. Acting out after her rural pub-owning mother forbids her from dating a much older “cradle snatcher,” teenage Holly runs off to find him only to catch...well, she comes to doubt his reliability, so runs away again and eventually winds up at a farm. During those dramatic hours, Holly’s autistic brother goes missing and she’s an eye-witness to a horrific murder. These traumatic events are knit into the remainder of her history. While Holly appears throughout, she’s not always the central figure. Later sections emphasize other players as well as Mitchell’s fooling around with other literary genres (à la Cloud Atlas). For example, “Crispin Hershey’s Lonely Planet,” a funny and irreverent middle section set in 2015, stars an exceptionally vain and petty author (aka the Wild Child of British literature, a man with more than a passing resemblance to Martin Amis) who has stalled for years with his career-reviving next masterpiece. He briefly meets Holly, who has written an enviably popular memoir about hearing voices in her head during her youth. Holly’s part of the Script too, which ties her to and makes her an integral component of a centuries-old dispute between Horologists (aka Returnees, or Atemporals), a small group of immortal quasi-humans, and Carnivores (aka The Anchorites of the Chapel of the Dusk of the Blind Cathar of the Thomasite Order of Sidelhorn Pass), whose shortcut to immortality necessitates sporadic feeding on the souls of regular humans who have pronounced psychic abilities (the call it “decanting”). “An Horologist’s Labyrinth,” the novel’s thrilling and taut fifth section, offers a play-by-play of the epic final battle of the War between these two powerful factions. Do you have a spare hour? These feuding immortals have an elaborate but sketchily drawn cosmology (complete with proper nouns) and concurrent terminology. They talk of pyscholassos, chakra eyes, quantum totems, Acts of Exposure and Reveal, and psychosoteric potential. There’s the Deep Stream (as in, “Is a psychoferno a Deep Stream Invocation?”), the Way of Stones, Black Wine, the Dusk, the Shaded Way, and the Seaward Wind to the Last Sea. There’s a Codex, a Script, and a Counter-Script. Their silent communication is frenetic with subwaking, subasking, and subreplying. By giving his characters mouthfuls like “I revoke my cloak and invoke a body-shield” and “Even without using those methods, unless you’re hidden by a Deep Stream cloak, they could get to you with a quantum totem,” Mitchell sincerely courts silliness. That’s tricky too, but... In SF Eye #5, back in 1989, influential science fiction writer Bruce Sterling sought to define “a contemporary kind of writing which has set its face against consensus reality. It is a fantastic, surreal sometimes, speculative on occasion, but not rigorously.” He added, “this is a kind of writing which simply makes you feel very strange; the way that living in the late twentieth century makes you feel, if you are a person of a certain sensibility. We could call this kind of fiction Novels of Postmodern Sensibility, but that looks pretty bad on a category rack, and requires an acronym besides; so for the sake of convenience and argument, we will call these books ‘slipstream.’” Handily enough, The Bone Clocks fits into that definition. Mostly in southern England and Ireland, but there are important scenes set in Canada, the United States, and Switzerland. Plus: Russia circa 1816, Western Australia in 1871 and San Marino near the mid-seventh century. In other words, the metalives of characters such as Xi Lo and Marinus have occurred in dozens of bodies and locations. "Is it similar to Cloud Atlas?" Yes, quite, especially in terms of structure. The warring immortals aspect is new, though. Yes, definitely. Even if the occasional silliness grows bothersome, you can’t doubt the author’s mastery. Short fiction: "Ways to Ruskin"